As I read Brian Whelan (January 21) condemn the actions of the recently murdered French cartoonists, I thought of the film ‘Life of Brian.’ Banned in this country for many years, I think I watched it at least a dozen times before the ban was lifted. The little men who banned it, thought it offensive, even hateful. Then I thought about Father Ted. An entire sitcom dedicated to mocking the type of people who banned Life of Brian and hundreds of other films and books. After that I thought about the thousands of barbs, small and large, that gay people will have to endure, as we approach the marriage equality referendum. There are people who think gay children should not be subjected to the prejudices of others. They reason that children do not have the fortitude to cope with wounding words. They would see their enemies silenced, for is not attacking the beliefs and rights of any group, a form of hate speech? We should certainly consider banning ridicule and offence. We should consider it so that we may realise how monumentally dangerous this would be. If a belief or ideology cannot survive being mocked, then it’s probably not a worthwhile idea in the first place. 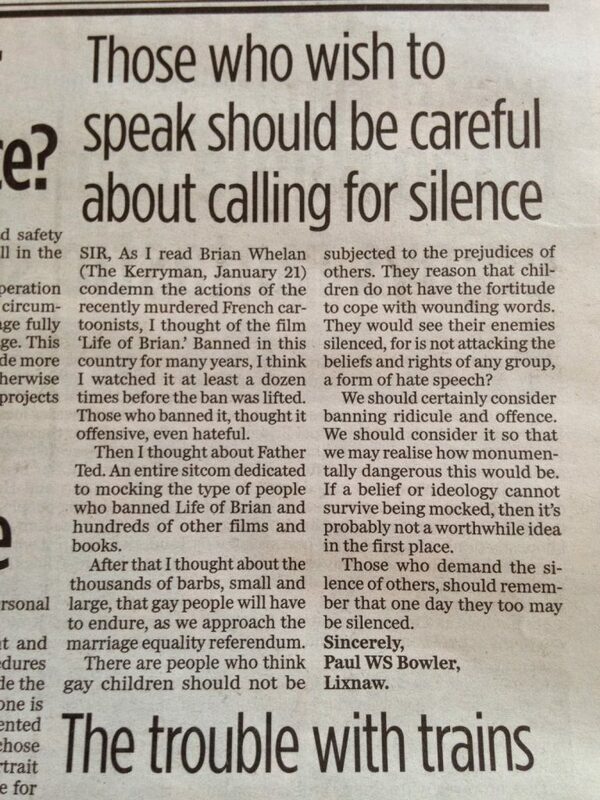 The little men who demand the silence of others, should remember that one day they too may be silenced.